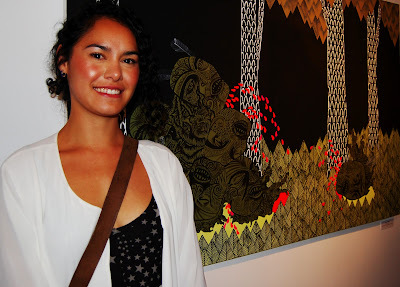 Artist Jade Townsend with her work 'Bay of Plenty'. Quirky and cool. Matchbox Studios opened its doors on 19 May to a bubbly crowd of art and design enthusiasts. Pay them a visit at 166 Cuba Street and peruse the range of art, design, and photography on display. Check out my full article on Thread.co.nz at http://www.thread.co.nz/news/6508/15/Match-highlights/d,thread-article. With photography by Locheen Craig.